So last Wednesday, I took one of the biggest exams in my life so far. It was called SA3 and it was an actuary exam. This is the last exam out of the 15 you need to pass to become a qualified actuary, or to 'get the fellowship'. I started on this actuary journey in 2010, taking my first two exams in April 2011 so just three years ago. I had worked the related field of credit risk modelling for about three years before, it was fairly similar work but no exams to take. Out of 15 exams, I was granted two exemptions from my degree in Economics and Finance in UCD. Those were CT7 Economics and CT8 Financial Economics. That left 13 exams to do. I passed CT1 and CT2 in April 2011, then got CT3 and 6 in September that year. I passed CT9 in November. Next came CA1 in April 2012 and CT5 in September. I failed CT4 so I retook it in April 2013 along with ST7. I passed both of them so I took ST8 in September 2013. I passed that first time too. Straight after that I took two practical exams, CA2 and CA3 one week after the other. I went off to the UK as I got earlier dates if I did that. I managed to pass both of them first time too. If you've been keeping up, that is 12 exams passed so far! With my two exemptions, I am up to 14/15. I have now achieved Associateship, however, over here, not many people bother transferring to that class so I officially remain a student. My one exam left, SA3 is the big one. It's an exam on the whole General Insurance (aka P&C) industry. While there is a syllabus, you have to do a lot of outside reading and a huge amount of studying. It's particularly tough as only about 40% of people will pass in any one sitting. They generally only ask two separate topics so if you don't know about one, that's probably it for you. For the last six months or so, I have been studying for this exam. My work kindly support me through a study scheme which meant from the start of the year, I had about one day during my working week to study. I had to supplement that with hours and hours of weekend study and a few evenings after work too. Studying mainly involves teaching yourself via reading notes. You can also practice questions and also do assignments and send them away to be marked. Nearer the exam, you can take a three day tutorial (which I did) and attempt the past exam questions. You also need to read around things like GIRO papers and other actuarial publications. Over the last month, the pressure has really increased. I had a full week off to study before the exam, which was brilliant but terrible at the same time. I got a lot done and I felt prepared for the exam (as much as I could be anyway!). My exam was on Wednesday. I had certain things I wanted to come up and certain things I didn't want to see. Overall, I think it was a decent paper and I have a shot at passing. I won't get the results for 3 months now. However, I am absolutely delighted it's over either way. This will be the longest time since 2010 that I haven't had to study for. If I do pass, I will never need to study formally again (unless I choose to!). 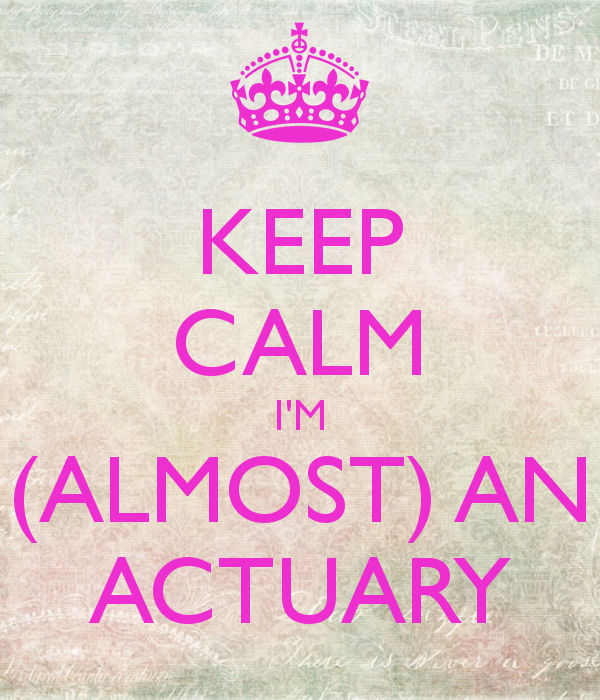 I will get to use the letters FIA (Fellow of the Institute of Actuaries) and can call myself an actuary properly. I am so excited to think that this could really be happening in a few months! If I fail, I am sure I will pass on the second go which is in September so I am not too worried. This is the final step on a long journey for me. I will be achieving something only a few hundred people in Ireland have done and a huge goal in my life will be ticked off the list. In some ways, it might leave a hole in my life but I'm sure I will be well able to fill it. I will keep you posted on the results and let's hope I pass this! Fingers and toes crossed, you'll do great!